Among the two types of springs, garage door torsion springs are considered the most powerful ones because they are meant to be suitable for heavier doors. The truth is that all springs are very powerful. In a different case, they wouldn't be able to lift the door. Their main duty is to balance the door so that it can open evenly at the two sides and lift it. Thanks to the power of torsion springs the door also remains open at any height and closes down at the right speed. If torsion springs are damaged, the door would slide down, won't remain open or won't open in the first place. The torsion spring is installed above the door around a metal shaft. It remains stationary at one end and turns on the other creating torque and that's how the door opens. 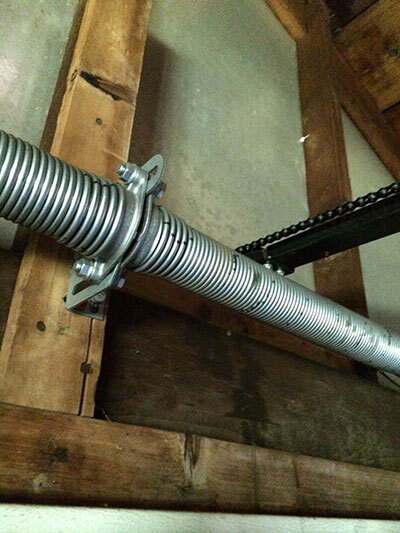 Garage door torsion spring repair is the specialty of our technicians. Their significance is too high and that's why every technician at Garage Door Repair Neptune Beach is properly trained to fix torsion spring issues properly. Due to their importance but also their tension, our company also provides emergency garage door repair to eliminate problems before they put your life in danger. Torsion springs work with enormous power as their coils turn and their sudden breakage might lead to accidents. We like to prevent such unfortunate situations for our clients by providing preventive services at your convenience. You can have confidence in the abilities of our professionals. When it comes to torsion spring garage door systems, we are the perfect choice. We keep all winding bar sizes at our trucks, have perfect training, are very careful during garage door torsion spring replacement and make sure the right spring has been chosen for your system. We offer emergency services if the spring suddenly snaps or when you need adjustment and Clopay torsion spring installation. We are well prepared, knowledgeable and deal with garage door torsion springs and their problems with ease. So, don't hesitate to give us a call if you need help.